Schöppingen Germany, 04/06/2018 – At the end of 2015, Shopware moved to its new headquarters in Schöppingen, Germany. Last Monday, less than three years later, the software company officially started construction of yet another building to make room for massive expansion. The company now has more than 150 employees. With the new building, Shopware is taking account of the rapid growth in all areas of the company. "We reached our capacity limits some time ago. 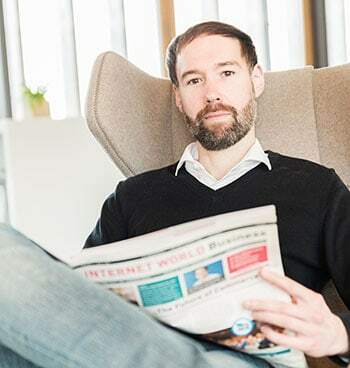 By moving into the autobody workshop next door, however, we were able to find an attractive and short-term solution to continue offering our employees an excellent working environment until the new building is completed," says Sebastian Hamann, CEO of Shopware. The new building is to be completed by spring 2019 and will accommodate 150 additional employees. The six-storey building is being built on the company premises and will be a hybrid construction. The supporting structure on the ground floor and the staircase are made of concrete, and the supporting external walls of the upper floors are made of wood. Wood and concrete composite ceilings are also used. "Despite its size, the building has an elegant appearance – the open concept inside also underlines our company philosophy. The extension seamlessly reflects the architecture of the existing headquarters, creating an attractive Shopware campus in Schöppingen," says company spokesman Wiljo Krechting. The construction project, which was conceptualised by the architectural firm Bock Neuhaus and Partner, will be implemented by the Brüninghoff Group from Heiden. The company specialises in the development, planning, prefabrication and construction of challenging general contracting projects throughout Germany. "The degree of prefabrication – especially in the supporting structure – is just under 80 per cent. It is particularly high on the upper floor. 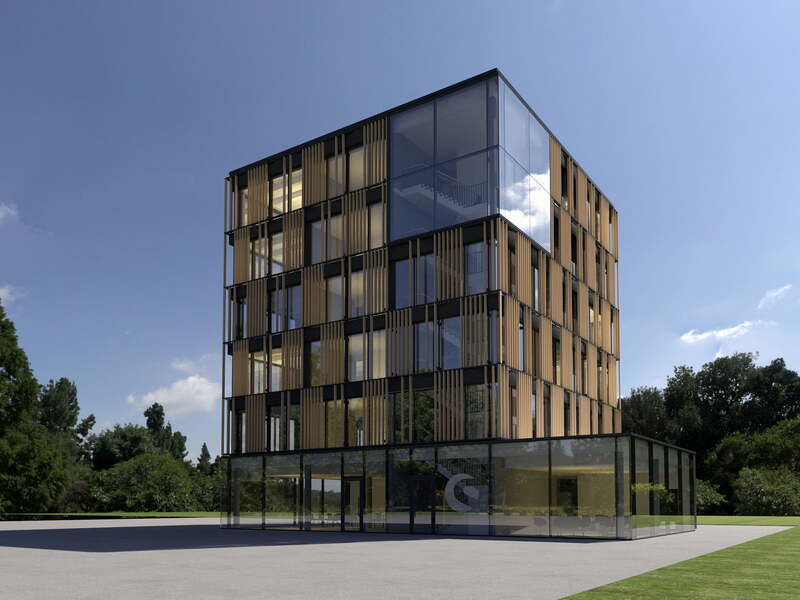 For example, the external walls including a mullion-transom facade, StoVentec Glass and wooden slats are prefabricated at the Heiden plant and transported to the construction site," explains Brüninghoff project manager Christian Heynk. 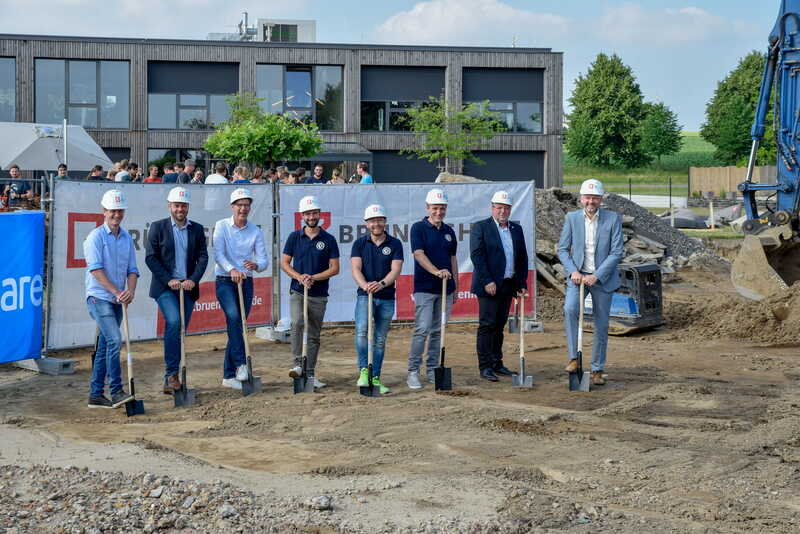 The guests invited to the ground-breaking ceremony, among them mayor Franz-Josef Franzbach, were impressed not only by the hybrid construction and short construction period, but also by the development of Shopware. "Shopware has been a valued and integral part of the community for years. With the new building, they not only show that strong and sustainable growth can also work in rural areas, it is also once again a clear commitment to Schöppingen as a location," the mayor was pleased to say.